In 1808 the brothers John and William Ridgway jointed their father Job's factory at Cauldon Place, Hanley in Staffordshire and in the same year the production of bone china was added to that of earthenwares. The early Ridgway porcelains were in Spode style, with quality, scenic bat-prints and some colourful designs in "London"- shape teawares. In 1830 the two brothers separated. William Ridgway concentrated on the production of earthenwares. John continued the Cauldon Place Works and was later appointed Potter of Queen Victoria, making some magnificently decorated porcelains. Around 1833 five hundred people were employed at the pottery, and many talanted artists were engaged in production of fine painted pieces, some of which are believed to be the work of George Speight and Daniel Lucas, known for their landscape and figure painting. Thomas Brentnall, George Hancock, and Joseph Bancroft have also been employed, specializing in flower painting. 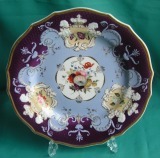 John Ridgway exhibited at the Great Exhibition of 1851 and their catalogue shows the great variety and quality of the porcelain produced by the factory at this time. In 1856 John Ridgway & Co. gave way to Ridgway, Bates & Co., to be followed on John's retirement in 1858 by Bates, Brown-Westhead, Moore & Co and than from December 1861 by Brown-Westhead, More & Co., a firm that continued until 1904. 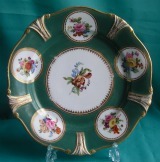 A rare Ridgway porcelain dessert plate* c. 1810, the centre painted with flowers, surrounded by five flower vignettes on a green ground, gilded rim. Dimensions: 22.5 cm. diam. Unmarked. Fine condition. * This shape is known as "Harbold" (John Harbold queried the earlyer attribution in Godden's Ridgway book), Margaret Ironside re-atributed this shape to Hicks & Meigh. Machin made a version of this shape with pattern 325 and 411. A Ridgway Porcelain Part Teaset, pattern 2/187, c.1820, comprising 3 saucers, 3 teacups and a coffee cup of London shape , richly decorated with cobalt blue ground and different floral compositions in cartouches and elaborate gilding. Marks: 2/187 painted in red and puce. Condition: Minor damage. A Collection of 4 Ridgway bone china teacups & saucers, decorated with floral designs c.1835-40, patterns 2/6871, 2/7013, 2/7801. Printed marks in puce. Fine Condition. A set of three Ridgway two handled dessert dishes in rococo shape, bone china body, ecru ground border moulded with leaves picked out in gilt, the centre painted with landscape scenes. Pattern 6937, c.1850. Dimensions: centre dish 24.5 cm x 30.5 cm., the other two 29.5 cm x 23.5 cm. Marks: printed Royal Arms mark in puce. Fine condition. A Ridgway bone china teapot, stand and sugar-bowl, moulded in rococo revival style, decorated in enamel coloures and gilt. c.1845. Dimensions: teapot 20cm high; stand 22cm diam; sugar-bowl 15cm high. Marks: Royal Arms mark printed in puce. Fine condition. A Ridgway porcelain dessert plate c.1830, painted with a landscape on a green ground border. Dimensions: 9.25"(23.5cm) diam. Condition: a tiny nibble on the rim. Marks: 1/2416 in puce. A part Machin/Ridgway* Porcelain Dessert Set, comprising 8 plates and 3 dishes, painted with flowers in the sentre, the "Moustache" border decorated in cobalt blue, cream and gilt, c.1825. Dimensions: 22cm diam. Marks: 733 painted in black, red and gilt. Condition: 3 plates with small hairline, some ware on the gilding. *Attribution of this pattern is still disputed. It is illustrated in " Machin Porcelains & Earthenwares " by Bill Thom and Philip Miller, page 136 as "possibly Machin" but many collectors still favor Ridgway. An English dessert plate, possibly Ridgway c.1820-30, painted with roses on an apple green ground, cream and gilt.Dimensions: 9.5"(24cm) diam. Fine condition. Unmarked.